I've nevr photographed Mahone Bay as much as I have this summer, Every time we happen by, there seems to be a different mood. This foggy afternoon was irresistible to me! On this Saturday, the town was having an always-well-attended Scarecrow Festival with decorations throughout town. Simultaneously, there was an excellent-&-sizable Quilt Show, a Book Fair and a 3-location antique show! Having already been to the Lunenburg Rotary Flea Market, we simply ran out of time to peruse books! We returned home to have that dinner party that didn't end until long after midnight! This active retirement lifestyle is going to do me in! I know you all know the Carl Sandburg poem, "Fog"..
@ethelperry Hi Ethel...thanks! My MOST favourite poem is by Christina Rossetti, and fits me perfectly...though I never did understand the title, First Fig... "My candle burns at both ends, it will not last the night, But ah my foes and oh my friends, It gives a lovely light!" I suspect you're like that as well... It would be criminal to have so many choices and not partake of some of them! This is so lovely....almost like a painting! The beautiful autumn colors in the trees picked up by the steeple of the church on the left, the layering of the water, the rocks, the green belt, and then the row of cars in the foreground, and then who could ever miss that Canadian flag!! Great capture, and well worth the possibility of being rear ended!! It happens to me so often that I see something as my husband is driving on the freeway, and then I pout because he could not stop so that I could photograph it! @panthora Thanks Osia! (I'm trying very hard to learn not to pout overtly...ha!) I just had to share a funny thought about the flag! I've begun to think that if you want the wind to stop, try to photograph a flag! Want it to start? Try to photograph a flower... There's a direct corollary! Imagine my wonderment when I saw this photo...with THAT flag...and I wasn't even waiting for it! Conclusion...The Powers that Be didn't notice me lurking in the bushes across the water... I think I've cracked the code! The mist is notable. Great capture. The different layers of the scenery are spectacular. Great shot Louise, good to see the flag flying there. 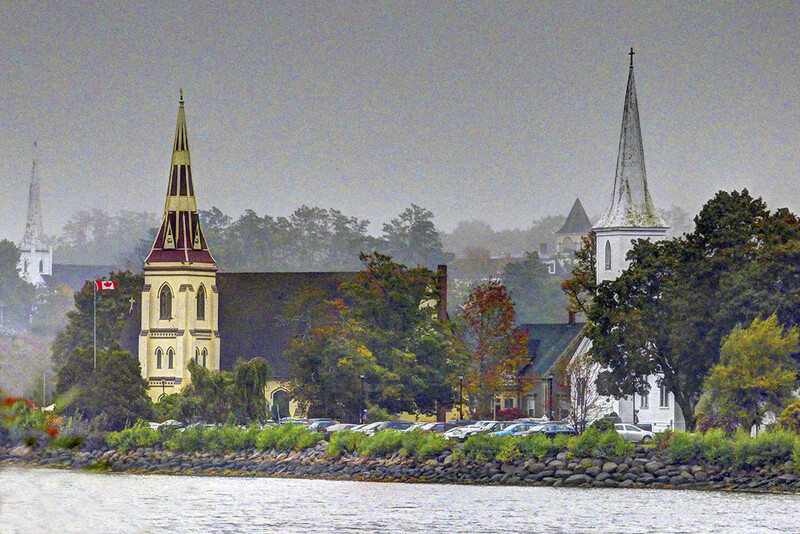 Terrific capture of the famous Mahone Bay scene. I really like the fog. fav. Wonderful capture! I love misty days. fav. Oh you have done it proud. This is a fab spot. My husband and I went to a wonderful concert there one evening when we were vacationing up there.